These are a buttery rich cookie with almond flavor. They are always on our cookie tray every year. 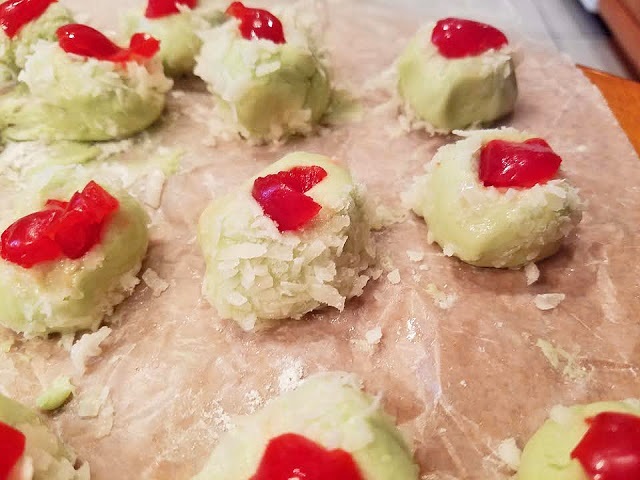 I love these myself personally anytime but during the holiday tinted green they sure make a great addition to any cookie tray. These are one of the must make cookies for our Christmas tray every year. Not just because they are green, white and red for the colorful effect on our tray but because they are so darn delicious. This is the most asked for cookie every year from everyone in the family. Of course it helps if you love the coconut and cherry combinations. 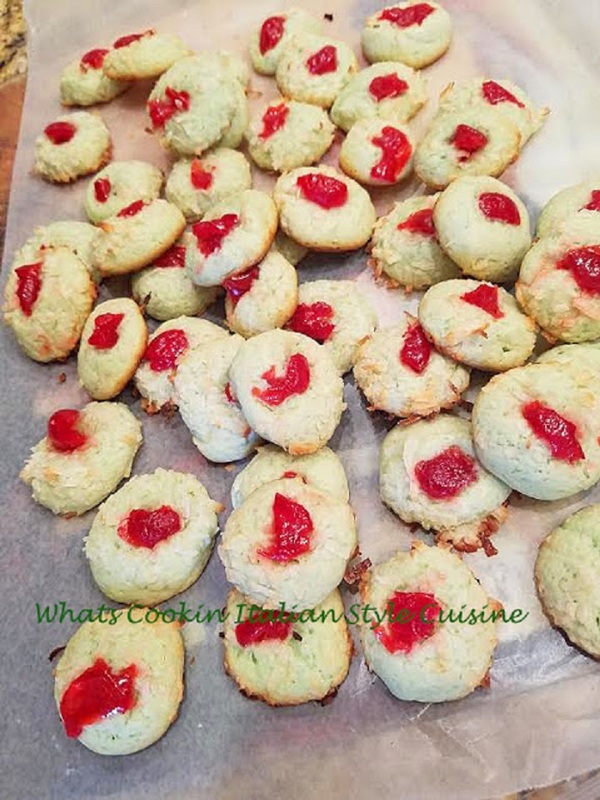 The cookie goes great with coffee or tea and has a delicate buttery flavor that enhances the coconut almond flavor. The cookie is so easy to make. 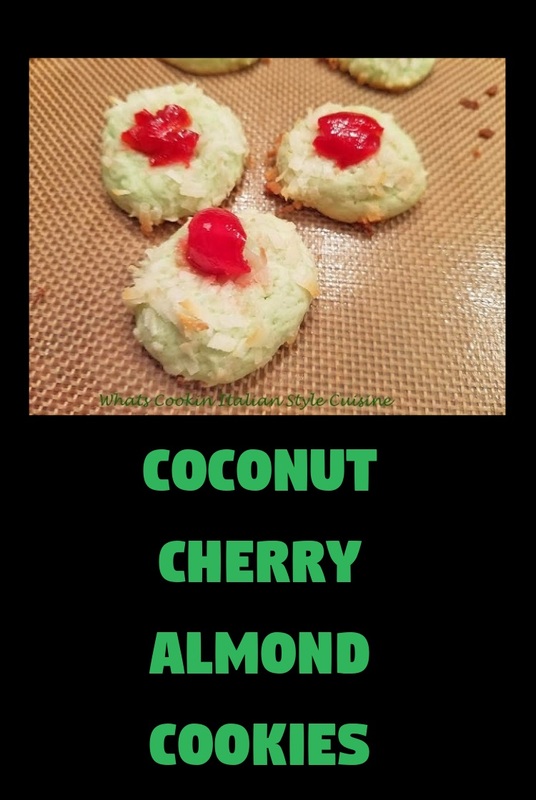 These coconut cherry almond cookies can be made in no time with little effort. The dough is soft and doesn't spread too far. I like to make a double batch since I give many away. 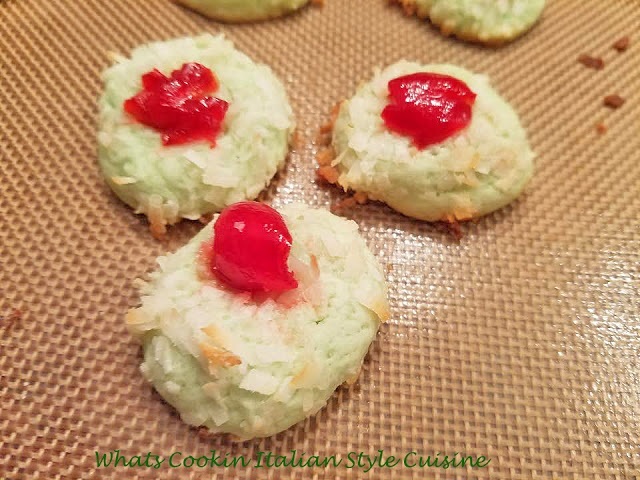 I just love the green tint in the dough and the snowy coconut for that Christmas look. Then all you have to do is add the cherry on top and viola, you have the perfect Christmas cookie! After the dough comes together wrap in wax paper and refrigerate for at least 1 hour. Using flour if dough is sticky, roll a teaspoon of dough into a ball. Dip into reserved egg whites then into nuts or coconut. Add cherry to the center. Bake at 350 for 7 to 8 minutes until set and edges begin to brown. Love these kind of cookies and Grumpy does too. Great idea to tint green but I would eat them no matter what! These are darling and I'm sure they're tasty. Perfect cookie for the holidays. Wishing you and yours a very Merry Christmas! So perfect for Christmas in their red and green splendor! And rolling them in coconut makes them even more appealing! !